Did you know that business cards have been around since the 15th century? They originated as a way to announce the arrival of royal visitors and eventually evolved to serve their current-day purpose – sharing contact information with potential business clients. MOO Print Limited recently shared the infographic below outlining the evolution of the business card, but they forgot to mention the most recent development in the business card industry, business card CDs. Business card CDs are mini CDs that are cut in a rectangular shape to emulate that of a traditional paper business card. You can print the cover of these discs with your title and contact information just as you would a regular business card, but with the ability to store between 30MB and 100MB of data these cards can share a whole lot more information including resumes, sales proposals, product catalogs, and more. And with an estimated 10 billion business cards being printed in the United States each year, these digital cards also provide you and your company a way to stand out from the others. 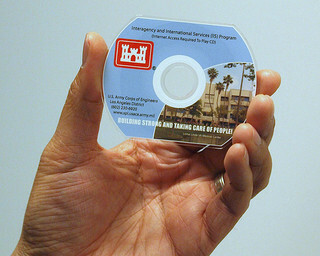 Total Media, Inc. can create, print, and duplicate business card CDs for you and your business. Call or e-mail today to discuss how!